> Owners of Ferrari 458 Spider, watch out for flying eggs! 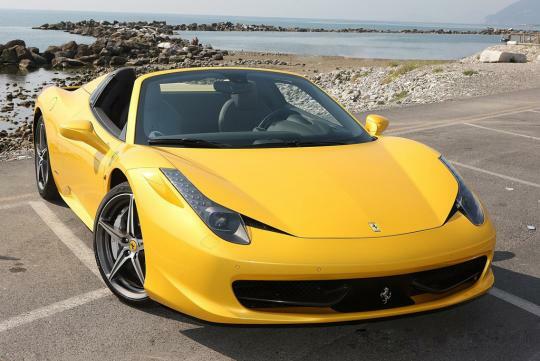 Owners of Ferrari 458 Spider, watch out for flying eggs! It seems that some of those who live in London just can�t tolerate exotic cars. Only recently, a cyclist in London stopped right in front of a Lamborghini Aventador and even stared down on the driver. Now, another Londoner seems to get mad at such exotic cars for no apparent reason at all. So, there was this woman who was driving a Giallo Modena (yellow) Ferrari 458 Spider in London. Unfortunately, all of a sudden, someone showed his/her rage on the unfortunate woman by throwing an egg into the convertible car - whose roof was retracted at the moment. It seems that this outraged person just couldn�t resist being mad and showing it to the public. Frankly, I would say that the person must have envied that young and successful woman. Unfortunately, without the outraged person�s realising, his act would actually do no good to anyone. As a matter of fact, the person might have just made life harder for those who work at a car wash - for they will have a hard time trying to dry the egg and get rid of the smell it carries.